In January 2014, the European Commission awarded a contract to the Dutch firm Ecor to research sales displacement (loss) rates on copyrighted content due to internet piracy. The report was completed in May 2015 but it appears the European Commission didn’t like the report’s conclusion – the results were skimmed and buried until Julia Reda from Pirate Party Germany launched a freedom of information request to make the document publicly available. It confirmed what Pirate parties around the world have been saying all along – that piracy cannot be conclusively said to cause financial harm to authors and creators, and that there are choices for those selling copyrighted works which are more likely to boost their sales than further attempts at cracking down on piracy via regulations or rights management, which often breach and erode the civil rights of everyone. It’s true that the study did find the strongest potential displacement effect (sales loss) in films and TV shows at 27-40% for the first year of release with this loss being most prominent in cinema visits, where distribution companies will often restrict access through other channels to try and funnel consumers into their preferred medium (cinema). It’s interesting to note also that this potential loss was offset by an increased rate of legal streaming and DVD rentals as a potential side effect of online piracy. What’s extremely interesting is that the study found the average consumer ideal (most willing) price for films and TV shows was below the average market price, suggesting overpriced content is a significant driver of piracy rates[2.1]. Using an alternate approach the report also suggested there may be positive links between piracy and legal transactions of media, that increased piracy in some instances resulted in increased content sales. This was most prominent in concert goers who also streamed or downloaded music, and people who downloaded games[2.4]. Pirates who illegally downloaded large amounts of content were not found to have caused any lost sales[2.2][2.3]. In an analysis of other studies examining the effects of piracy, there were many conflicting or insignificant results. Earlier studies (2000s) tended to show a decrease in physical sales correlated with an increase in digital piracy, however this can be explained by the rise of the internet and how much easier it is to access content online[2.4][2.5]. The study did not examine the effects of regional or platform availability into the rates of displacement, although ease of access to content is often cited as the most common motivation for piracy among Australians. Pirate Party Australia opposes stifling monopolies on the basis that they needlessly drive up costs for the end consumer. 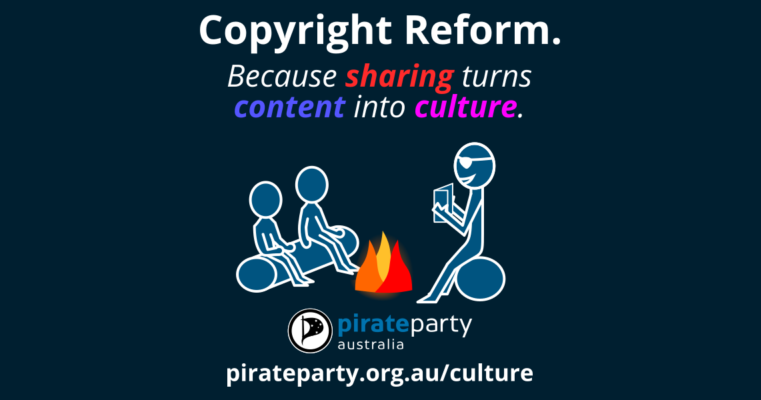 Pirate Party Australia propose the introduction of a new Creative Works Act to limit corporate rightsholder abuses through copyright law on creativity and culture, as this report has shown the claims of rightsholders need to be tested with evidence before legislators further extend copyright laws causing more harm than good.